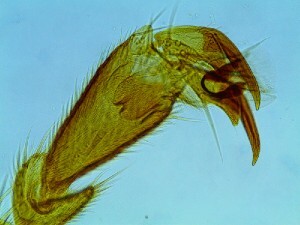 Some tinkering with the microscope. 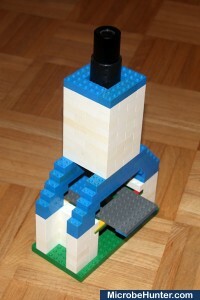 Making a microscope out of LEGO is not difficult and it works quite well. 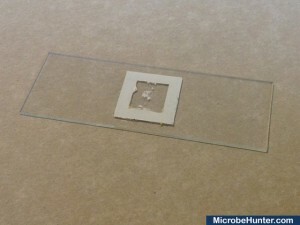 How do you make dry-mounted permanent slides? Dry-mounted permanent slides do not use a mounting medium. It is necessary to hold the cover glass in place using adhesive tape. 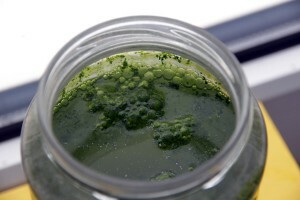 A drop of inorganic fertilizer greatly enhances the growth of algae in a mini-aquarium. How can I see tardigrades? Tardigrades (water bears) can be found in moss. Focus animation of the leg of a bee. How can I make a hay infusion? Short answer: Don’t. Do not make hay infusions, as this is too risky. How do I make a wet mount? The wet mount is the most common way of preparing objects for microscopic observations. How can specimens be prepared for observation? Many every day objects can not be directly viewed under the compound microscope, because they simply do not meet the criteria. These objects must first be prepared. How do I correctly turn on the microscope? Correctly switching on the microscope protects the light bulb and your eyes. 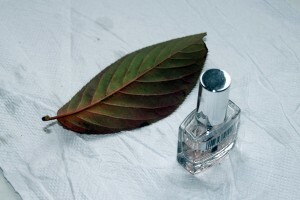 Apply some nail polish to make impressions of leaves. This way you can observe the epidermis of the leaf.